Cook tapioca as directed on package; drain. Rinse with cold water until cooled. Whisk peanut butter and honey in medium bowl until blended. Gradually stir in milk, then tea. Spoon tapioca into 4 tall serving glasses. Add tea mixture and ice. Serve each with a sturdy thick straw, occasionally stirring drink with straw. 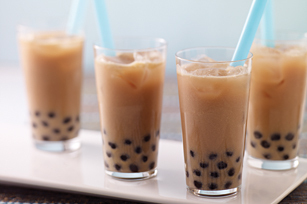 Using the light no-sugar-added soy milk and peanut butter in this variation of bubble tea help make it fit into a healthful eating plan.